Don't have a lot of time in Washington DC? Enjoy the highlights of the National Mall in about 3 hours! Look Abraham Lincoln right in the face. See where the President lives and works. 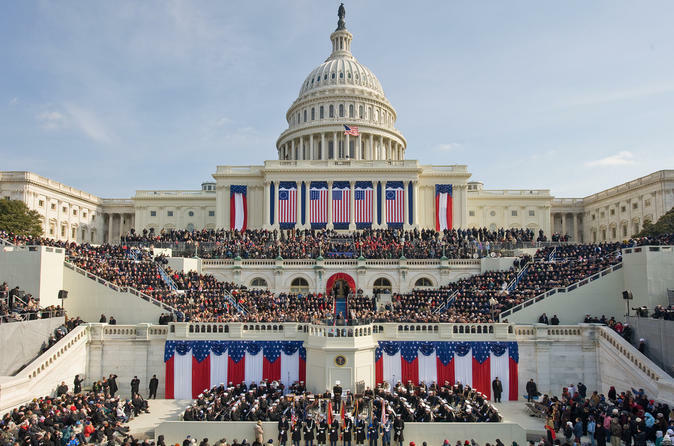 Enjoy views of the National Mall from the same place where the inauguration takes place. Ride through the city in your personal luxury SUV as you are transported from attraction to attraction with the funnest and most knowledgeable Tour Professional in the city. You'll begin your tour by being picked up from your hotel by your Tour Professional who will take you to the U.S. Capitol Building for a photo opportunity. Then it's a ride down the inaugural parade route to the White House for a photo opportunity as well. Then it's off to the National Mall. Your next stop will be the World War II Memorial. Then you'll take a short ride to see our third president and principle author of the Declaration of Independence, Thomas Jefferson. Our newest memorial is next on your agenda, Rev. Dr, Martin Luther King Jr. Then you'll enjoy what we affectionately call the big three, the Korean War Memorial, the Abraham Lincoln Memorial, and the Vietnam War Memorial. Your final stop will take you on ride across the Potomac River over to the state of Virginia to see the Iwo Jima (Marine Corps) Memorial. You'll see the statue that was created from the iconic photo taken by Associated Press photographer Joe Rosenthal of 5 Marines and 1 Navy corpsman pushing up an American flag on Mount Suribachi during one of the most trying times of World War II. You will then be taken back to your hotel after your whirlwind tour of Washington DC wondering how you saw all of what you saw and didn't feel rushed one bit. Let us take care of your day and make your visit to Washington DC...perfect.